Justin Bieber Disses JoJo Siwa And Social Media Is Outraged That He’d Start Beef With A 15-Year-Old! 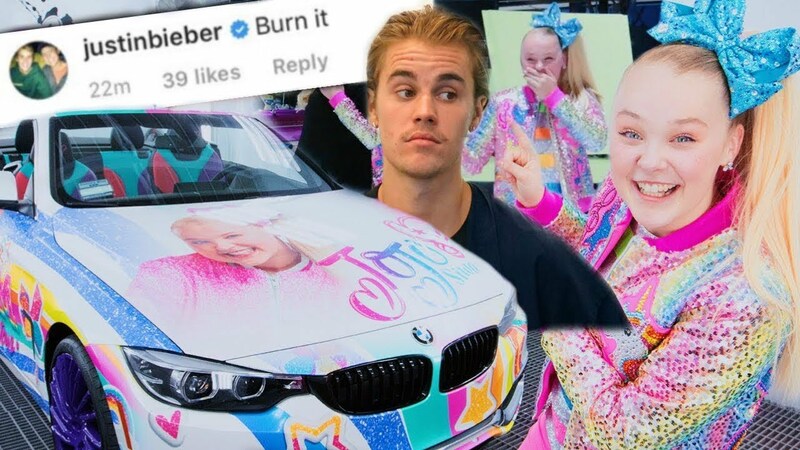 Bieber then took to his Twitter account to explain why he wrote ‘burn it’ under the dancer and online creator’s pic of a custom-car that she received for Christmas! As you can imagine, at first, fans were pretty disappointed that Justin would start beef with a young teen for no reason except to be malicious. West Coast Customs designed a car with Jojo Siwa’s face on it and gifted it to the hyper, bow-wearing internet star. The girl was super excited to pose with it and share the pic with the world. Oddly enough, Bieber wrote, not once, but twice, the words ‘Burn it’ in the comment section. People were not too sure what to think – was the star dissing Jojo or just kidding around? Jojo took it as an offense as she wrote ‘Burn it’ on her Twitter account and pinned it at the top. Obviously, the girl was not happy about Justin’s comment. While some fans tried to defend Justin, saying that he probably meant that she should ‘burn it’ as in ‘to drive the car fast,’ Justin took to his own platform to confirm that he really meant that she should set fire to the vehicle. ‘@itsjojosiwa I have nothing against you it was the car and the colors I didn’t like I really hope you didn’t think it was malicious or mean-spirited,’ he explained. Well, at least he’s honest! But way to ruin the girl’s excitement!